Data from IC Insights reveals the IC foundry market saw a growth of 14 percent last year to total sales of $42.84 billion. The largest 13 foundries took up 91 percent of the market in 2013 and TSMC is by far the largest, the Taiwanese foundry saw its sales soar 17 percent to $19.85 billion, which amounts to nearly half of all foundry business. GlobalFoundries remains in the second spot with sales of $4.26 billion, up 6 percent year-over-year, while UMC sticks to the third spot with revenue of $3.96 billion, also a rise of 6 percent year-over-year. TSMC, by far, remained the leader with almost $20 billion in sales in 2013. In fact, TSMC’s 2013 sales were over 4x that of second-ranked GlobalFoundries and 10x the sales of the fifth-ranked foundry SMIC. 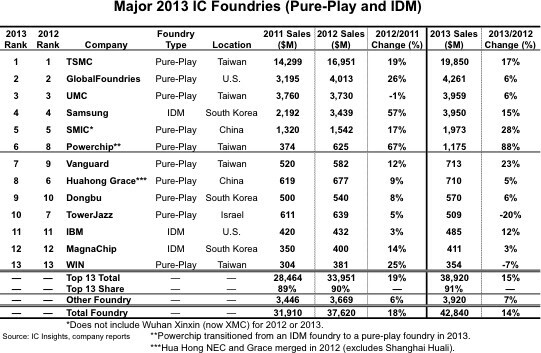 As shown, there are only three IDM foundries in the ranking – Samsung, IBM, and MagnaChip. Samsung was easily the largest IDM foundry in 2013 with over 8x the sales of IBM, the second-largest IDM foundry.